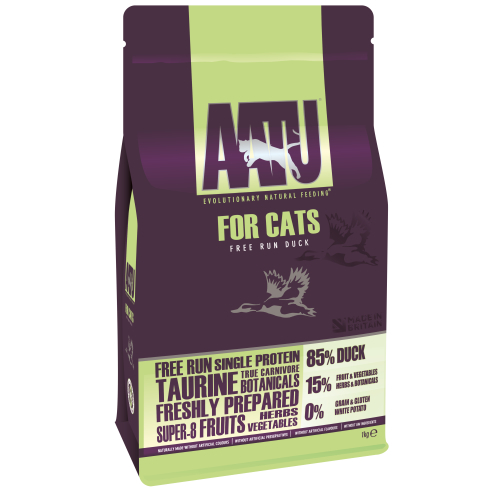 AATU Duck is an evolutionary natural feed for cats. Based on the knowledge that cat’s ancestors were natural predators. Modern cats are not that far removed from their ancestors, requiring a high meat diet and often referred to as obligate carnivores, which means, ‘by necessity.’ Simply put, cats must eat meat to survive – it’s a biological necessity! Cats also have the specific requirements for certain amino acids such as Taurine, Arginine and Tryptophan. High levels of these are naturally found in meat. This is the prime reason for the development of AATU for Cats, a bespoke and unique 85/15 diet, made up of 85% meat for your obligate carnivore! •	85% Free Run Duck, 15% Fruit and Vegetables, 0% Grain, Gluten and White Potato. •	Complete balanced food for cats. •	Highly concentrated – over 3kg of ingredients to make 1kg of finished product. •	Free from grains, white potato and gluten. •	A very glycaemic diet. •	Handcrafted in small batch recipes, naturally made without artificial preservatives, flavours and GM ingredients. 85% Duck: (50% Freshly Prepared Deboned Duck, 35% Dried Duck), Sweet Potato, Chickpeas, Duck Stock, Peas, Lucerne, Tapioca, Apple, Cranberry, Pear, Blueberry, Mulberry, Orange, Bilberry, Cowberry, Carrot, Tomato, Chicory, Peppermint, Parsley, Cinnamon, Marigold, Stinging Nettle, Camomile, Rosehip, Yucca, Spirulina, Seaweed, Aniseed, Fenugreek, Oregano, Sage, Marjoram, Thyme. Protein 34%, Crude Fibres 2.5%, Crude Oils and Fats 20%, Crude Ash 8.9%, Moisture 7%.